2nd August 2014 – On the final evening of the athletics programme at the Commonwealth Games, it wasn’t just the rain that was pouring in but medals as well as PACE athletes claimed at total of 5 during the session. These were led by two in the mens 4x100m where World and Olympic Champion Usain Bolt (JAM) joined the newly crowned Commonwealth Champion Kemar Bailey-Cole (JAM) to form half the Jamaican quartet that stormed to victory in a new games record of 37.58 seconds. They were matched by Schillonie Calvert (JAM) who ran the third leg for Jamaican womens team that took victory in 41.83 seconds, also a games record. Matthew Hudson-Smith (ENG) showed that is he is more than ready to step into the senior ranks with an exceptional run on the anchor leg for the England 4x400m team. Setting off just behind the leaders Trinidad, Matthew blasted into the lead up the back straight and then showed great strength to hold off a late challenge from the Bahamas. 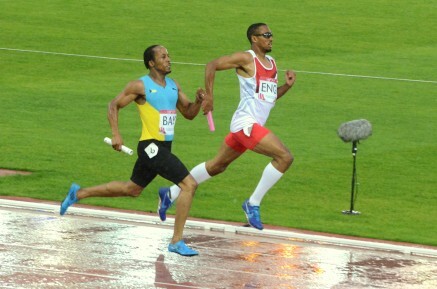 His split of 44.56 contributed to a fine winning time of 3:00.46. Defending World individual 400m champion Christine Ohuruogu (ENG) added yet another medal to her ever increasing collection as she led off her 4x400m team that claimed bronze. Phillips Idowu (ENG) battled with the horrendous conditions to take fifth in the triple jump and Steph Twell (SCO) was fourteenth in the 5000m. Away from the track, three PACE athletes were racing on the roads at the Beach to Beacon 10k. In the mens event defending champion Micah Kogo (KEN) was unable repeat his victory finishing 5th on this occasion in 28:14. Emmanuel Bett (KEN) was just a place and 4 seconds behind in sixth. In the womens race Jordan Hasay (USA) took fourth place in 32:19.